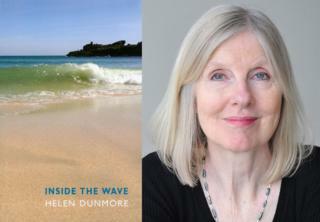 Helen Dunmore has won the Costa Book of the Year prize for her 10th and final poetry collection, Inside the Wave. The Costa awards including the prize for poetry, which she won earlier this month, recognise authors based in the UK and Ireland. Dunmore died from cancer in June 2017 at the age of 64. The overall winner is chosen from five books which had already won prizes in the categories of novel, first novel, biography, poetry and children's book. The ceremony, previously known as the Whitbread Book Awards, has taken place annually since 1971. Judges described the collection as "an astonishing set of poems - a final, great achievement". Dunmore is now the second writer to win the overall prize posthumously, following Ted Hughes in 1998. He was awarded the poetry prize and Book of the Year for Birthday Letters. Inside the Wave is the eighth poetry collection to take the overall prize and beat bookies' favourite Eleanor Oliphant is Completely Fine to take the title. The collection, Dunmore's tenth, explores the borderline between the living and the dead. The debut novel from Honeyman tells the story of a survivor of a childhood trauma. It is set to be adapted for the big screen by Reese Witherspoon's production company, Hello Sunshine. The story of many lives haunted by one family's loss. The judges - who include BBC News presenter Sophie Raworth, actor Art Malik and presenter and author Fern Britton - described it as "hypnotic, compelling and original." A family memoir about her life - and her late father's life - inside the Exclusive Brethren, a Christian fundamentalist separatist cult. Inside The Wave explores the borderline between the living and the dead and includes Dunmore's final poem, Hold Out Your Arms, written shortly before her death. An adventure story set in the Amazon rainforest.